Contains (6) 16oz. 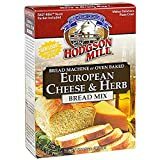 boxes Hodgson Mill European Cheese & Herb Bread Mix. A unique and flavorful blend accented with natural herbs, two cheeses and wheat flour. A wholesome, delicious mix for making artisan-style bread at home, by hand or in a bread machine. All of Hodgson Mill's bread mixes come pre-measured and pre-mixed, with a packet of our reliable Hodgson Mill Fast Rise Yeast. Easy to make by hand or by bread machine, for easy, delicious, fresh-baked bread in the comfort and convenience of your own home. 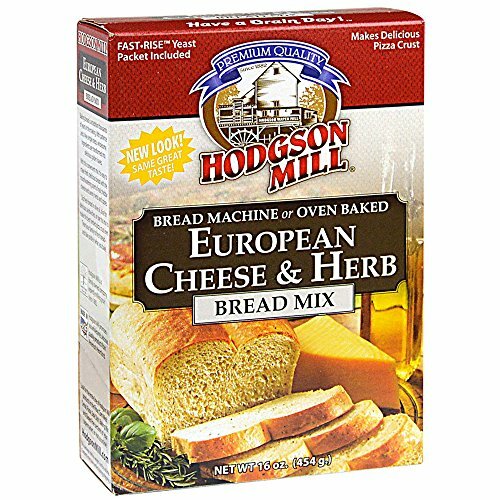 Hodgson Mill offers a variety of quality whole grain products for your family. Look for "whole grain" on the package and in the ingredient list. You don't have to be a gourmet cook to begin eating healthier. That's what we mean by "Have a Grain Day!" At Hodgson Mill, we produce simple, sustainable, delicious grain-based foods that you can feel good about feeding your family. In a variety of flavors, from a variety of grains, Hodgson Mill brings you premium grain products to make into delicious meals. We look for grains that are the highest quality, produced domestically wherever available & purchased in the United States. We use stoneground milling to ensure, unlike other mills, that our products contain the entire nutritional benefit of the grain.